High Peaks Pure Earth has noticed an upsurge in online activity by Tibetan netizens about being Tibetan and Tibetan identity. This video “I Am Tibetan” was first posted on a Chinese video-hosting website on December 19, 2009 and has been circulating widely. It came later to be posted on YouTube by a Tibetan called Jigdo and is now being disseminated by Tibetans all over the world through social networking sites such as Facebook. To those who don’t know Tibetan, the video seemingly looks like a random talking heads video. Once you understand what the people are saying, it is one of the most powerful and creative videos we have seen from Tibet. The camera focuses on random Tibetans, each statement begins with “I am Tibetan” and the next speaker goes on to describe the reason. The video has already inspired Tibetans in Dharamsala to replicate the concept. The dramatic music in the background creates a strong sense of mood and urgency. 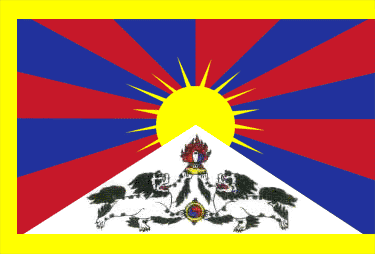 The emphatic statement “I am Tibetan” is a powerful assertion of how the people identify themselves. In the statements there is no sense at all of being “a minority”. As readers know, over the last two decades the Chinese government has been carrying out patriotic education campaigns, the objective being for Tibetans to identity themselves as a subject of China and identify himself or herself as a Chinese national. In an earlier blogpost High Peaks Pure Earth posted pictures of a banner hanging outside school gates in Lhasa, one of which proclaimed, “I am child of China, I like to speak Mandarin”. This second video “Let’s (all) Speak in Pure Tibetan” has also been on a Chinese video-sharing website for sometime now. 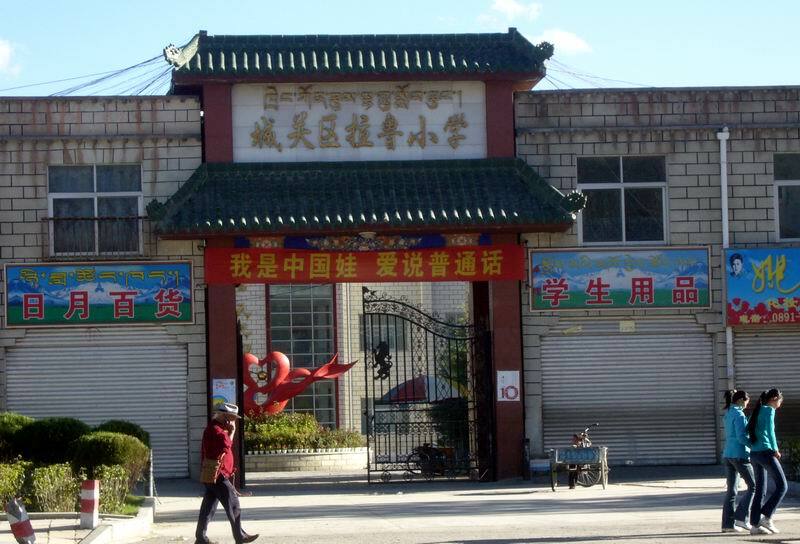 The video narrates a verse that is spoken in Lhasa dialect and urges everyone to speak pure Tibetan. In the translation, it is evident to what the video is saying and we shall leave the analysis to our readers. I’ve a means of survival passed on by my Ancestors. (My) language is Tibetan. It’s my abiding tool. The Tibetan alphabet is the heart and soul of my existence. Let’s all speak this Tibetan language (of ours) for the continued survival of our nation(ality). Let’s (all) speak in pure Tibetan. 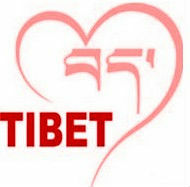 Even though you may know a variety of languages, when we Tibetans talk amongst ourselves, let’s (all) speak in Tibetan. When we converse in Tibetan, let’s speak in pure Tibetan. It’s widely infected with the scourge of hybrids from different tongues. O my beloved brethren from the three provinces of Tibet of the Land of Snows! The rise and fall of our nation ultimately hinges on this root issue. (My) language is Tibetan. It’s my abiding tool. (My) language is Tibetan. It’s my abiding tool. For the sake of continued survival, let’s all speak this Tibetan language of ours. Then, let’s not use any hybrid language when conversing in our day to day life, O people of the Land of Snows! 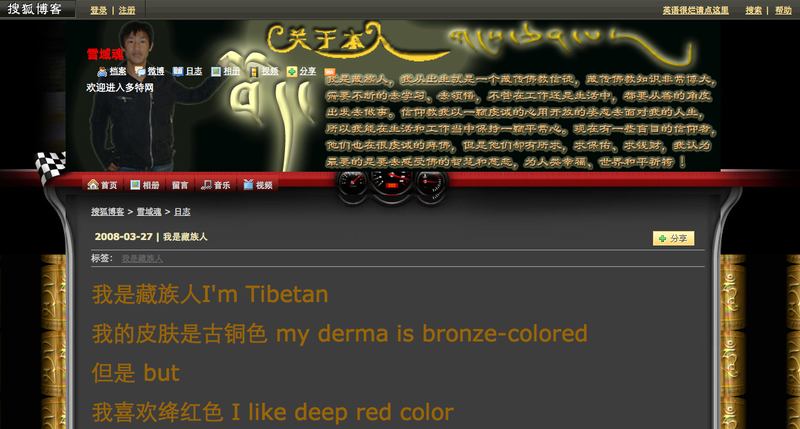 On Tibetan blogs, High Peaks Pure Earth has followed this poem “I Am Tibetan” that spread to numerous blogs throughout 2008 and 2009. The same poem can be found here, here and here, just these examples show that the poem was being posted as early as March 27, 2008 and as recently as August 16, 2009. Thank you for the translating and showing us this wonderful songs and texts. It's great to see we Tibetans are embracing our identity as Tibetans. As a Tibetan in exile, I know that whatever new place we live in, we Tibetans always will remain Tibetan. We are a proud people, and in this instance, pride is a good thing -because no matter how brutally the Chinese government tries to transform the tibetan spirit, their guns and hate will never crush our tibetan-ness. we are tibetan and we love tibet. This is truly beautiful and i appreciate the post. Thu Che Nang. 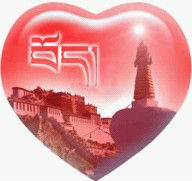 I am a Tibetan and i can;t love Tibet enough! I am a Han who lived in Shanghai for most of primary education and strangely I can find myself actually relate to this. The central government has not only been trying to phase out the tibetan or uighur language/culture (the western world only seems to see this..) but Han subgroups culture as well. Han Chinese itself is actually a *very* inclusive term. Hans from western, eastern, northern, southern, different provinces etc all have very different subcultures and local dialects that sound nothing like each other(they do share the written language, for the most part). And since I was born and put through school I have never been taught my local dialect (Shanghainese, a Wu language) and have always been pumped with endless propaganda to speak mandarin. I saw a lot of banners like that in that school picture all over my school, in shanghai. I only learned Shanghainese because my grandparents ONLY speaked Shanghainese and I had to learn it to communicate with them. Most of my classmates and even my own cousins of my generation cannot Shanghainese anymore. The influx of migrants from all over China has also increased the language's disappearnce. In another example, only 10 years ago if you went to Guangzhou ('Canton') you would need a translator if you spoke only mandarin, now you need a translator if you only spoke Cantonese. Sounds familiar to the Tibetan narrative now, doesn't it? While I agree having a common language is essential to keep China's economic framework moving, the government's great efforts to wipe out the local identies and establishing a central one is now backfiring and reasonating in people all across China. We all love our local identities, Han or Tibetan.